The rapid deterioration of some Belize City streets as a result of four weeks of constant rains has prompted the Belize City Council to seek additional funds to extend its total number of streets that it will have given priority to as part of its infrastructure works, and the attention they will receive include drainage as well as resurfacing. Today Mayor Darrell Bradley told Love News that by the end of the street upgrades, the Council will have dealt with well over 100 streets. And while the works on the streets are expected to be completed by the end of this year, the BTL Park will not be ready for re-opening for December 7 as planned. But Mayor Bradley says that the newly retrofitted and modernized park will be ready in time for Christmas and the re-opening will be with a bang. As a part of the re-opening of the park, the Council will distribute gifts to 15 children. The Christmas tree lighting at the BTL Park, says Mayor Bradley, won’t interfere with the traditional downtown Christmas tree lighting, which is scheduled for this Friday. Meanwhile, on the issue of the absentee Councilor, Eric Chang, who left Belize for China in September and has not yet returned, Mayor Bradley says that within the next week or two, the Council will move to remove him as Councilor, ceasing his salary payments. Mayor Bradley says that while the Council has been functioning without Chang in office and it is not necessary, there would still have to be a bi-election to elect Chang’s replacement based on the law. 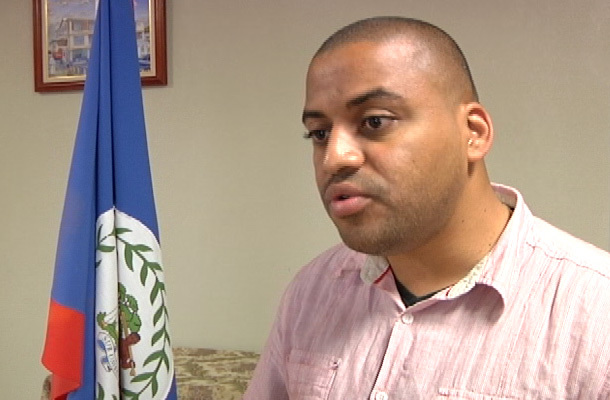 We also asked the Mayor about the outstanding debt that the Council owes to Belize Waste Control to collect garbage. Belize City Mayor, Darrel Bradley. But before he offers himself for any political office - mayor included - Bradley has to rehabilitate his image, which, right now, means rehabilitating streets that have fallen to ruin with the last month of rains. Today the City announced that major works will start on two high volume traffic areas. The work will block or partially block two major access ways into the city:..
"One of the two major arteries in the city will be interrupted; one being our present location at the corner of Partridge Street and the George Price Highway. The entire section between the Lord Ridge Cemetery; from Partridge Street to its junction with Vernon Street will be worked on commencing tomorrow morning at 10am. Because of the works that will be carried on of course we will have to do some traffic diversion. I take this opportunity to inform the public of the altering routes that will be provided. At this time we are looking at for entry and exit from the city we are looking at utilizing Western Avenue and Mahogany streets and this will be for the larger vehicles; goods trucks, delivery vehicles and trailers. We will be asking these drivers to utilize the Western Avenue/Mahogany Street route." "For smaller vehicles we will be utilizing Vernon Street as the entry and exit point. As well we have just been informed that works are to be commencing on the Flag Monument Round-about. This is a project that will have significant impact on the motoring public and as such we will be carrying the works out in a way so as to not let the burden be too hard on the public. While the works are on-going at the Flag Monument Round-about a lane will be kept open so as to facilitate the flow of traffic in to and out of the city, but we are asking motorist if it is not absolutely necessary for you to venture into that area as much as possible. Try to use alternate routes such as St. Thomas Street, Coney Drive and the other streets that are in the area." Work on the Western Highway will take two to 3 weeks and on the Belcan roundabout, 10 - 12 days. What’s Up With Pen Road? Another area that's in a mess is Neal's Pen Road, which was just paved this year. The work was obviously inferior and after the rains, the street looks just as pot holed as any 10-year-old street. The road was paved under the southside poverty alleviation project and we asked the man behind that project, Boots Martinez, who is also the area representative, what went wrong:..
"We believe that the heavy downfall of the rains, but that is not no instrument for making excuses. The contractor must go back and do what is necessary because we have a guarantee period and as I understand it the Ministry of Works have contacted the contractor to repair or make the necessary adjustment to the street." "I would look at that street as the materials were maybe inferior, the compaction was maybe inferior and the works itself maybe chip and seal need two layers, maybe it never had the proper two layers. That looks like an inferior job to me." "I can't say, because again it's not the whole of Neal's Pen Road, it's a portion. You will say 85% of the road is holding. It's only certain portion and it was properly supervised by engineers. I don't know what failed that portion and I am not trying to play any engineer, but I know it must be rectified by the contractor." We could not reach the contractor which is a Mennonite outfit out of Blue Creek. Last edited by Marty; 11/29/13 03:59 AM.